MODUS stars James Wade and Simon Whitlock remain on course to meet in the final of the Ladbrokes World Championship after an unforgettable quarter-final day at the Alexandra Palace. Wade won an epic battle to overcome John Part in classic encounter, while Whitlock thrashed Gary Anderson to progress to the semi-finals. The Machine came out on top in what is already been described as one of the greatest darts matches ever, winning a sudden death leg to conquer three-time world champion Part, eventually winning 5-4. He faces defending champion Adrian Lewis in tomorrow’s semi final. Wade took out five finishes of over a hundred, most of them at crucial times and under extreme pressure, as he moved a step closer to winning his eighth major title. The World Championship has eluded him so far but victory over Jackpot would move him within touching distance of glory. Whitlock will play Andy Hamilton after producing a sensational display to defeat bookies favourite Gary Anderson. The Wizard gave the Premier League champion a ruthless lesson in finishing to book his place in the final four. That magnificent victory leaves him on the verge of reaching his second world final in three years. Both players showed that they have what it takes to become World Champion and either would be a worthy winner. www.modusdarts.tv will continue to provide updates and reports throughout the remainder of the tournament. Simon Whitlock insisted he can defy the odds and win the Ladbroke’s World Championship, after silencing his doubters by thrashing bookies favourite Gary Anderson to reach the semi-finals. The Wizard was told by doctors, just four weeks ago, that he would not be going to the Alexandra Palace at all because of his broken ankle. Remarkably, he is now just one game away from reaching his second final in three years. 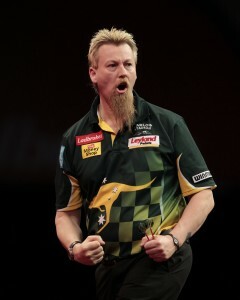 If Whitlock comes through that match he will face either Adrian Lewis or James Wade in Monday’s final. The Australian said that clinching the title at the Ally Pally would mean everything to him. “The crowd here are incredible; it’s a really special place and an unbelievable feeling when they get behind me. To become World Champion here would mean the world to me” he said. Simon Whitlock remains on course to be crowned World Champion after another sensational display saw him demolish bookies favourite Gary Anderson in the quarter finals. The Wizard provided a master class in finishing to see off The Premier League winner, posting an impressive 42 percent success rate on his doubles. He reeled off five consecutive sets to set up a semi-final showdown with Andy Hamilton. Anderson held his throw in the opening leg before Whitlock hit double top to do the same. The Flying Scotsman then produced a 151 finish to prevent Whitlock from snatching an early break of throw. It was Anderson who grabbed the first break of throw in the very next leg, as he hit double five to go a set in front. The Wizard hit double 18 to take the lead in set two. He then slotted in his first 180 to put pressure on the Anderson throw, and he made it count by producing a stunning 121 finish on the bullseye. The Scotsman broke back and then held his throw to level the set before Whitlock struck back, hitting double four to leave the match tied at a set each. Whitlock hit another maximum against the throw but was unable to get the break, as Anderson hit double one to edge in front. The Australian replied with his third 180 and went on to hit double top to hold his own throw. He then made his opponent pay for missed doubles with a ruthless two dart finish, taking out 74 against the throw to take the lead. The Wizard hit double eight to win the set and go ahead in the match for the first time. Whitlock continued his charge, opening the first leg of the fourth set with back to back maximums, eventually hitting double one to hold his throw. The world number five then broke the Scotsman’s throw, but Anderson broke back straight away before holding to level the set. The Wizard conjured up his sixth 180 in response, going on to open up a two set advantage by hitting double seven. The 2010 runner-up hit another maximum against the throw and took out 58 to win the first leg of set five. Whitlock produced another clinical checkout, this time 81, to move closer to claiming another set. He wrapped it up straight away by breaking throw again to increase his lead to four sets to one. Anderson managed to break the throw in the first leg of the sixth set, and he hit tops to double his lead. The Wizard responded with a fantastic fourteen dart leg, before firing in another 180 on his way to another break of throw to leave himself throwing for the match. Whitlock almost won the match in superb style but just missed the bull for a 95 checkout, but he cleaned up the 25 to book his place in the semi-finals after another relentless performance. Whitlock will play Hamilton on News Years Day for a place in the final. James Wade moved a step closer to winning his first Ladbrokes World Championship title after beating John Part in an amazing sudden-death leg at the Alexandra Palace. The Machine produced a stunning performance under no end of pressure from the three-time world champion, hitting five checkouts of over a hundred to win the quarter final clash. With the players inseparable after eight sets and eight legs, Wade held his nerve to win a tense final leg. He won the bull to take the darts and hit 81 followed by a 140 to move closer to victory. Part kept up the pressure with a 174 to leave 128, but missed his second treble. The Machine kept his cool and hit 85 in two darts to win the battle and book his place in the semi-finals. Wade hit double ten to hold his throw in the opening leg before grabbing an early break of throw by hitting double top. The seven-time major winner then found the double twenty bed again to win a third leg on the spin and take the first set. Part got a leg on the board before Wade took out 48 to level. Darth Maple held again but the world number three hit back with his first 180 followed by a fine 82 finish to square up the set. Part had to pull out a wonderful 167 checkout to hold his throw, pulling the match level. Wade hit double ten to take the lead in the third set and then produced a tidy 65 finish to break his opponent’s throw. The UK Open winner then wrapped up the set, hitting double ten to regain his advantage. The Machine then put on a sensational show to win set four, hitting a brilliant 108 finish against the throw. He followed that up with his second maximum before producing another fabulous checkout, this time 140. He then hit double top again to open up a three one lead. Wade continued to finish clinically when he took out 103 to edge ahead in the fifth set. Part held his throw to level before The Machine took out 84 in two darts to do the same. He then just missed the Bull for a 126 finish before the Canadian won the next two legs to win the set. Part held his throw in the first leg of the sixth set before taking out 116 to break again and double his lead. Darth Maple then took out 75 to level the match. Wade stopped the rot by hitting double top to hold his throw before his opponent did the same. The Machine hammered home another maximum before taking out 82 under pressure to edge back in front. Darth Maple held again and Wade responded with his fifth 180 but was unable to prevent Part breaking his throw to go ahead in the match for the first time. With Part needing to keep hold of is throw in the eighth set to win the match, Wade hit double hit ten to grab a crucial break. He then took out 81 to double his lead with a fantastic twelve dart leg. The Canadian held his throw to pull a leg back but The Machine found double top again to restore parity and force a deciding set. Wade hit double five under extreme pressure to hold his throw in the first leg of the decider before Part levelled. The Machine kept his composure under pressure again, hitting double two to edge back in front. Darth Maple held his throw again, meaning either player needed to win by two clear legs. Wade will play either Adrian Lewis or Terry Jenkins on Sunday evening for a place in the final. James Wade and Simon Whitlock are both still in contention to win the Ladbrokes World Championship after reaching the quarter-finals at the Alexandra Palace. The MODUS pair both progressed from the last sixteen on Thursday to boost their chances of becoming World Champion in 2012. Wade is the tournament’s most consistent player, having lost just one set en route to the last eight. He put on another solid display to defeat Steve Farmer 4-0, setting up a quarter final clash with John Part. The Machine has looked comfortable throughout the championship, and victory over the former World Champion would take him within touching distance of a seventh major title. Whitlock produced a stunning last set to halt a brave comeback effort from Michael van Gerwen. The Wizard had led three nil before the Dutchman managed to get level. The Australian then won all three legs in the decider to progress to the next round, where he faces Premier League winner Gary Anderson. 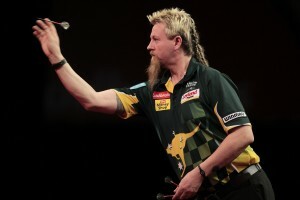 Whitlock hit twelve 180s and posted a finishing success rate of over forty percent in his last 16 victory. He is statistically the best performer in the tournament. Paul Nicholson exited the competition at the last 16 stage, despite producing a moment of class when he hit a sensational 170 finish. He lost to Belgian number one Kim Huybrechts. Wade will play Part in the second match of Friday afternoon’s session, whilst Whitlock takes on Anderson to kick off the evening session. www.modusdarts.tv will provide updates and reports throughout the day. Simon Whitlock believes things are coming together nicely in his pursuit of the Ladbrokes World Championship title, after another brilliant performance saw him progress to quarter-finals. The Wizard cruised through the first two rounds, despite trying to recover from a broken ankle, but it wasn’t all plain sailing in his victory over Michael van Gerwen. The world number five hammered in twelve 180’s and posted another quality success rate on his doubles to book his place in the last eight, but the ‘beard to be feared’ is not feeling the pressure of being the tournament’s star player. Whitlock will play his quarter-final tie in the first match of the Friday evening session. Simon Whitlock booked his place in the quarter-finals of the Ladbrokes World Championship, after he produced another classy performance to see off a spirited challenge from Michael van Gerwen. Whitlock hit an incredible twelve 180’s and provided a master class in finishing to cement his status as the star performer in the tournament. The former runner-up has every chance of going one better then his previous best performance at the Ally Pally, and his pursuit of the title will continue tomorrow. The Wizard hit his first 180 in the opening leg before hitting double four to grab an early break of throw. He found the same bed to double his lead and then took out 62 to break again and win the first set. Whitlock hit his second maximum in the first leg of the second set but was unable to prevent van Gerwen breaking his throw. Another 180 followed for the Australian as he broke back immediately. He then hit double top at the first attempt to edge in front, before hammering home a fourth maximum on his way to another break of throw. The Wizard hit double eight to increase his advantage to two sets. The world number five broke van Gerwen’s throw again in the first leg of set three, and he doubled his lead by hitting double eight. Whitlock hit 180 number five in the next leg, before brilliantly taking out 112 to win another leg against the throw and take the third set. Whitlock continued to finish at will as he took out 76 to go in front in the fourth set. His opponent then held his throw for the first time in the match. The Dutchman went on to break the throw in the next leg before taking out 53 to get a set on the board. Van Gerwen held his throw in the first leg of set five. Whitlock replied with another 180 followed by an 81 checkout to draw level. He hit his ninth maximum in the next leg before hitting a fabulous 82 checkout for yet another break of throw. Mighty Mike managed to break back, hitting double twelve to stay in the match before holding his throw to pull a second set back. The Wizard had his throw broken by the Dutchman, who then held to open up a two leg lead in the sixth set. Whitlock responded by taking his maximum count into double figures but van Gerwen broke his throw again to force a decider. With van Gerwen throwing first in the final set, Whitlock showed his class under pressure by starting with another maximum before checking out 60 to wrestle back control of the match. The 2010 finalist then produced another leg of real quality, hitting another 180 followed by a marvellous 96 finish. The Wizard finished the job off with another clinical finish, taking out 52 to reach the last eight. Whitlock will face the winner of tonight’s match between Gary Anderson and Colin Lloyd. James Wade remains on course to become World Champion for the first time after cruising past Steve Farmer to reach the quarter-finals of the Ladbrokes World Championship at the Alexandra Palace. The 28 year old has already won most major titles, and he moved a step closer to adding the biggest of them all to his impressive roll of honour by winning in straight sets for the second consecutive game. The Machine got the ball rolling by hitting double five and then pounced on a bizarre miscount from Farmer; The Train hit 180 when he had 176 left, before Wade set up double top and hit it for an early break of throw. The UK Open champion then hit double ten to wrap up the first set. Farmer hit double sixteen to get a leg on the board before Wade hit back with a tidy 96 checkout. The Machine hit a 180 before taking out 70 in two darts to break the throw. He then hit double ten once again to seal a two set advantage. Wade just missed double top for a 120 finish, allowing Farmer to sneak a break of throw. Farmer then held to edge closer to pulling a set back, but Wade hit double top in both of the next two legs to derail The Train’s charge. The six-time major champion then hit double two to take the third set. Farmer won the first two legs of set four to go within one leg of winning a set again. Wade hit straight back once more, hitting double eight for an instant break of throw, before hitting his third 180 on his way to levelling the set. The Machine finished the job in style by hitting a brilliant 116 checkout to book his place in the last eight. Wade will continue his pursuit of the title when he meets former World Champion John Part in tomorrow’s quarter-final. Three MODUS’ players are bidding to reach the quarter-finals of the Ladbrokes World Championship on Thursday at the Alexandra Palace. James Wade, Simon Whitlock and Paul Nicholson are all in third round action, and all of them have a realistic chance of being crowned World Champion for the first time. Whitlock is the player of the tournament so far, having shown fantastic form in his first two matches despite struggling with a broken ankle. The Wizard posted the highest average of the tournament in his first round demolition of Dennis Smith, before brushing aside Steve Beaton in round two. The Australian faces Michael van Gerwen in the evening session. James Wade is in action in the afternoon when he aims to take a step closer to adding to his already impressive trophy cabinet. The PDC’s second most successful player ever takes on Steve Farmer, and will be hoping to build on convincing victories over Petri Korte and Jelle Klaasen. Following Wade is Paul Nicholson. The Asset produced a clinical display to beat Alan Tabern in straight sets on Tuesday night. A similarly ruthless performance would surely see Belgian number one Kim Huybrechts become his next victim. The three MODUS players are arguably showing the best form of all the players in their quest for glory, having all come through the first two rounds comfortably whilst over title candidates have wobbled. www.modusdarts.tv will provide updates and reports of their progress throughout the day.